New York City’s light pollution leaves the stars invisible to the unassisted eye, making the city feel “like living in a low-ceilinged room,” according to artist Jon Morris. 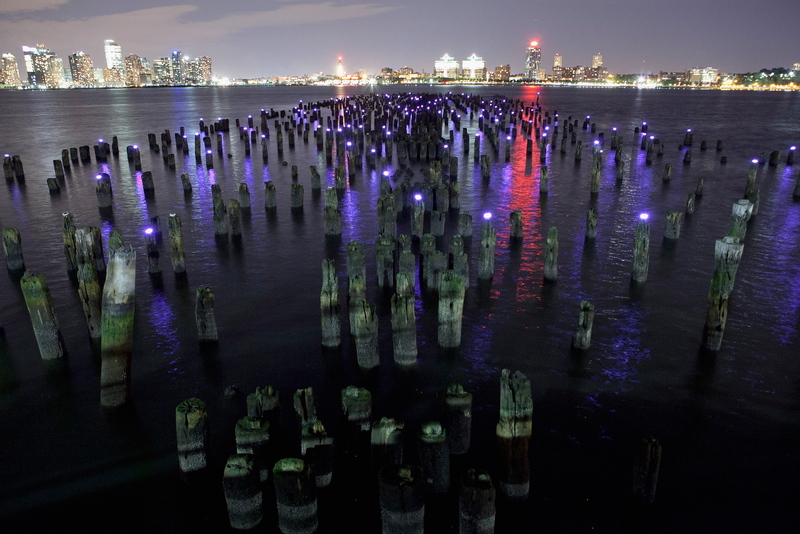 In response, the Brooklyn transplant created Reflecting the Stars, an art installation that re-creates constellations on the surface of the Hudson River. The display, unveiled earlier this week after a delay caused by Hurricane Irene, brings the natural wonder of the night sky down to sea level off Pier 49. The project began as a guerilla art installation. “I was thinking I’d just grab some lights, jump in, and attach them,” Morris said, but he thought it was too beautiful a concept to install with haste. The idea went beyond haphazard wires and waterproof lights. “The lights needed to disappear and not disrupt the beauty of the wood posts,” he said. Morris began with no knowledge of electronics, but fulfilling his vision for Reflecting the Stars meant adopting some major science. He worked with industrial designer Andy Baker to design the lights; when the question of compensation came up, Baker just asked that Morris take him to his first Burning Man festival in Nevada. Morris and Baker tried every way to make the lights work, but they kept running into problems with the solar charging sustaining bulb life. Jon reached out to a friend of a friend from his Indonesian dance ensemble, and soon Google software engineer Adam Berenzweig came on board. Berenzwieg had to realign his expertise. Rather than working with servers where memory is measured in terabytes, the lights for which he was writing software held around 1 kB of data. “I would spend an hour debugging and realize the problem was that I would overwhelm it with debugging code,” Berenzwieg said. The problem was power consumption. The lights had to conserve power during the day and run at a steady power level at night, all while self-monitoring battery life. “I designed a radio protocol to run every five seconds,” pacing the power output, Berenzwieg said. The last days of testing were conducted on the roof of Morris’ apartment building. They decided to go with the blue lights. “Blue does crazy things with your eye along the visible spectrum,” he said. More importantly, the blue light distinguishes the constellations from the New Jersey skyline. Once Berenzwieg and Morris finalized the design, the lights were set in pipe casings that would rust and decay with the wood upon which they were set. Morris and his installers took four and a half hours to set up the lights. They arrived at high tide and rode the flow from the highest pylons down to the lowest, affixing each light with a zip tie, legs akimbo, clinging to the barnacle-encrusted wood. At Reflecting the Stars‘ unveiling, after speakers discussed light pollution and the importance of humility in the face of stars, a woman whose mother had recently died came to spread her ashes across the lights. She spoke about how her mother would be moving on to a new galaxy this way. The lights will be on display as long as the LEDs last. 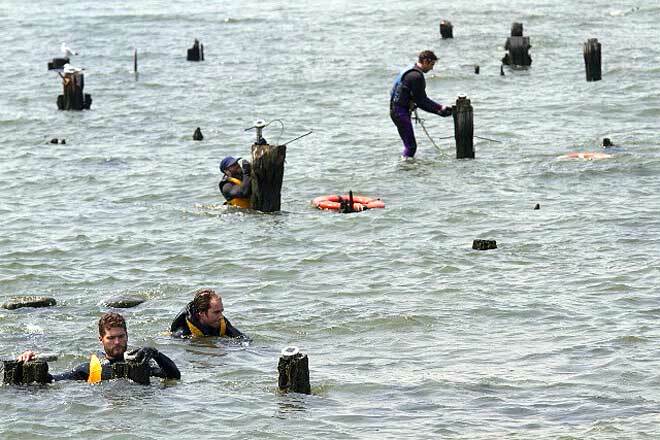 Wetsuits and life jackets make installation of Reflecting the Stars in the Hudson River more manageable.